Paul told Timothy, "But realize this, in the last days, difficult times will come" (2 Timothy 3:1). I believe we are living in the last of the last days. Jesus is coming soon! God has placed us on earth at this point in history to be salt and light to a lost and decaying world. 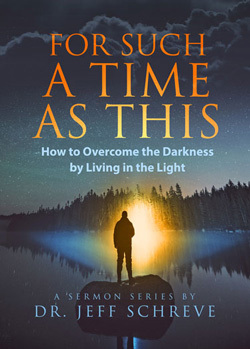 In this powerful nine-message series, Pastor Jeff Schreve challenges and encourages Christians to stand up for Jesus, "for such a time as this."